After doing my first semi-epic ride on the recumbent in over a decade, I can give an honest assessment of how it compares to a conventional upright bicycle. Here are some of the advantages and disadvantages. Long or steep climbs can be a chore. My Reynolds Wishbone recumbent is seven pounds heavier than my Cannondale 3.0, and a whopping 11 lbs. heavier than the Litespeed Super Bike. More importantly, you cannot stand out of the saddle for short bursts of speed and using alternative leg muscles. I learned to mitigate this by pushing alternatively hard with one leg and resting the other every 1.5-3 revolutions, but having really low gears is a must and in the vast majority of cases you will still be slower than if you were riding a conventional bike going uphill. It’s much harder to mount and dismount since when your put your feet down, your weight will be supported by a bent knee, not a straight leg. When I first started out I toppled over many times. At least on my recumbent that is a bit more aerodynamic than some of the others and I am fairly reclined, it is impossible to turn my head around enough to look behind me without having to do a gut-straining stomach crunch. Mirrors are essential. Fortunately, I came up with a solution that I think is better than eyeglass- or helmet-mounted mirrors or even most of the commercial handlebar mirrors sold in the marketplace. Exposure to the weather: Lying face up, it is easier to get sunburned and chilled than on a conventional bicycle where going into an aero-tuck can largely shield you from the elements. The Walden ride reinforced that I’d much prefer being on my upright bicycle in the rain and the cold. It didn’t help that when it rained, water from my rear tire was spraying the back of my neck! It’s not as maneuverable at low speeds due to the long wheelbase. It can be harder to carry stuff for long trips due to not being able to wear a backpack. I have a Camelback-like bag strapped with bungee cords to the back of the seat, but there is limited space behind there and the rear wheel. It is harder to reach and handle the water bottles. So for long rides, a Camelback-like device is essential. Since mine is bungeed to the back of the seat, refilling it is cumbersome. It can be more comfortable due to sitting on a real seat and not a wedgie. The “recliner chair” position can be very comfortable. I say “can be” because at least on my recumbent with minimal foam padding, the machine transmits jarring jolts to my entire body on rough roads. A recumbent is inherently more aerodynamic, making it potentially faster on the flats and downhills. My second-fastest double century ever was on the â€˜bent, and this included a bit of rolling terrain. The position means that you do not have to lift back your head to see the road, completely obviating getting “Sherman’s Neck.” You view the road more like as if you were in a car. 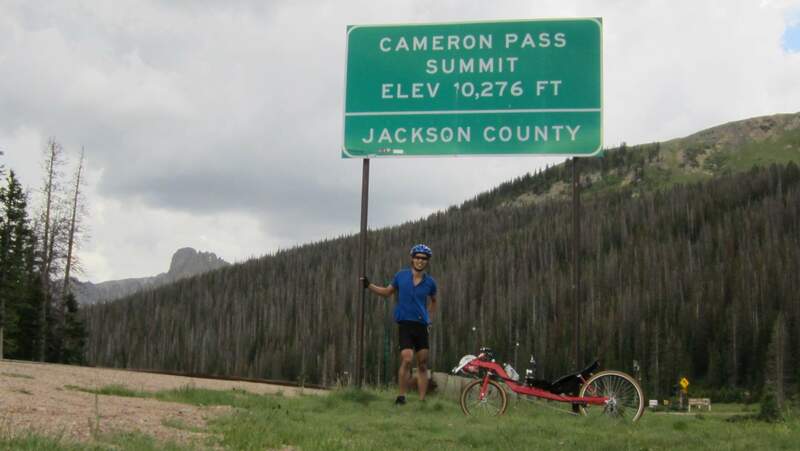 In my opinion, the cons—particularly regarding climbing—outweigh the pros, which can explain why I have largely relegated the recumbent to a trainer in the basement and the Tour de Fat ever since moving to Fort Collins. They are also probably why recumbents have not achieved mainstream adoption. But it’s still a fun machine and a nice way to mix it up a little in my favorite sport of cycling. Some detailed time comparisons are here if you are interested in a more quantitative analysis speed-wise versus upright bicycles. this is off topic but awhile ago you tested a pair of solid tires on your commuter but I haven’t heard much about them since. Are you still rolling these and what did you conclude? I sold the commuter bike a few years ago to purchase the vintage Gitane so haven’t been using the solid tires. I am thinking of mounting them on the Gitane though and using that as a commuter. My conclusion after using the tires for a couple years: not too much of a rolling resistance penalty in the winter, but more pronounced during the summer when the tires are softer. The ride quality is harsher but not intolerable. I would continue using them because I really hate flat tires, having changed about 150 or 200 of them in my lifetime and have been inconvenienced by them many times while commuting. I’m considering my options for a bombproof commuter set-up and there is a certain appeal to leaving the pump, patch kit, and spare tube at home without worry. By the way, I’ve ridden some of the doubles you’ve done in NorCal and know how tough any double can be. I’m amazed that you can ride one of these with so little training. Truly impressive.